There are 3 elected officials who, by their actions, are on the record. Who are these 3 officials who deem American Poker un-American? The 3 officials who pushed the UIGA Act through when no one was looking. Playing Poker – Now Easier than Ever. Ping Out: To Catherine Holahan for her consistently professional reporting on this issue over at Business Week. There is no ‘1’ solution to reversing the un-American UIGE Act, but collectively there are many ways to kill it. And that is exactly how this underhanded deal will be reversed – by the simple work of everyone. Poker Patriots supports all efforts to bring about the reversal and death of the un-American UIGE Act. 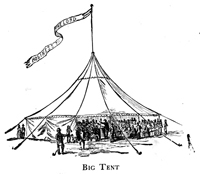 This is a pretty big tent. And it’s getting bigger by the day. Your voice is your most powerful weapon in this fight. Talk poker. Play poker. We support American Poker, its legacy and tradition. Poker is America. As the Mid-Term Election Day of November 7th draws near, it’s time to put the candidates on the record. Let’s post, online and for the record, the poker position of every candidate in the country. Call your candidate’s office. Go to the rally. Email their website. Write letters. Do whatever it takes to get them on the record, clearly stating their position on American Poker. Not sure who or where your candidate is? Start with the New York Times Election Guide. It’s always up to date. Then google your candidate, find their election office, and start demanding answers. The Poker Players Alliance has a very cool resource tool as well. We will not allow another double-dealing hypocritter into our government. We will put them on the record and hold them to their word. Thanks to Stephen Noh and the fine folks at Poker News for the action-oriented article on “What You Can Do to Support Online Poker”. His suggestion – write a letter to your candidate. Use the Poker Players Alliance Tool to help find your candidate and construct a letter. Fantastic work Stephen, Poker News and Poker Players Alliance. The movement to overturn the underhanded UIGE Act keeps building.